Most Americans can tell you that George S. Patton was a military leader. In fact he was a four star general credited with leading the U.S. to victory over the German army. Patton was loud and basked in the glory of achieving. His achievements included the following medals: Purple Heart, Bronze Star Medal, Legion of Merit, Silver Star, Distinguished Service Cross, Distinguished Service Medal. But the greatest action that he took did not involve getting a medal. The greatest act he took was realizing that he needed help. He was faced with a quandary. He needed to move 100,000 men and over 1000 vehicles and artillery units 125 miles in the snow and mud. This was, to say the least, virtually impossible. When the weather cleared soon after, Patton awarded O’Neill a Bronze Star Medal on the spot. The rest is history. Patton arrived with reinforcements and the German Army was defeated at Bastogne. In doing so the Allies held the line. The Germans retreated. Within 45 days Patton entered Germany and a surrender shortly followed. 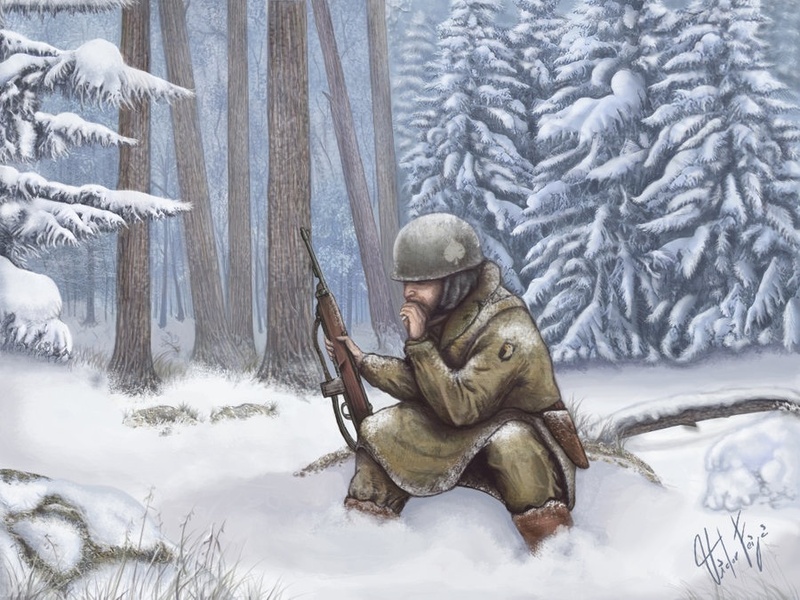 We are in a spiritual battle much like Bastogne. Conditions are tough. Our world is rapidly deteriorating both morally and spiritually. We are encircled and isolated. We are constantly under artillery fire from Satan. How can we win our spiritual battle? We must follow the same faith that Gen. Patton, Col. O’Neill and Gen. McAuliffe had. We must give the order; “Hold the line, close the gaps.” Prayer always works. We just have to believe. There is a song “Hold The Line” from the group Toto. If you know the song it will stick in your head for a while. I have never really paid too much attention to what the title meant, but loved the tune and the sound. I’ve been that way for all of my life. Unless something either draws my interest or tugs at my heart, I usually don’t pay a lot of attention to it. This caught my attention. Rather, this got my attention. The film was fictional but based upon real events that had happened a few years before. The country was Nigeria and the Seal team was from the U.S. Navy. It matched 300 rebel soldiers against a team of eight Seals. Eight highly trained soldiers stepped up to “hold the line” to allow 25 some odd people a chance for freedom. Sadly, while I write this, what is happening in Nigeria is not fictional. Today 27 Christian farmers were killed by the rebel group “boko haram”. They were killed because of their faith. In fact, over the past year over 1000 have been murdered. And tragically, 200 girls were kidnapped by the group, more than likely sexually assaulted, and then forced to convert to another faith. The movie broke my heart. As I sat in my beautiful little home, drinking iced tea, I was not giving a rip about the Christians in Nigeria. I don’t even think I had prayed for them. And sadly, I know I am in the majority by a landslide. This is where God started doing open heart surgery on me. You see I got it. We, as fellow Christians, are to “hold the line” for other believers by hitting our knees daily for those in dire situations. It could be for Nigerian missionaries, Ugandan orphanages, a pastor jailed in Iran or for food ministries in Denton Texas. Our job is to hold the line for all of them in prayer. The writer of Hebrews stated that we are to “hold fast the profession of our faith without wavering; (for he is faithful that promised).” Hold fast. Hold the line. It’s more than a song title. This was the first time in Luke’s five-plus years that the three of us did something like this. At one point I looked up and vividly flashed back to a time when I went fishing with my heroes, my Dad and my Granddad. A cool déjà vu moment, that almost did not happen. You see old man Parky tried to take this moment away from me. Parky is a SOB! He is a joy kill. He loves to create apathy, defeat and missed opportunities. I really noticed this when I tried to do something that had always been so simple to me. Something so elementary that I jumped right into it without even thinking about it. But, Parky got into the way. I could not put the worm on a hook. Hello my name is Defeat, let me introduce myself to you. This was the lie from Hell that entered my mind. As Luke stood there and watched my hand shaking so that I couldn’t bait his hook, I noticed he was watching my every move. I had a choice. Give into Parky and his friend Defeat, or turn this into a memorable moment. Luke has grown up with seeing the tremors. In fact, that’s all he knows when it comes to Daddy. He knows that I have Parkinson’s. He doesn’t fully comprehend it. But he sees it. At this point I ask God just to take away defeat and make this a joyful moment. 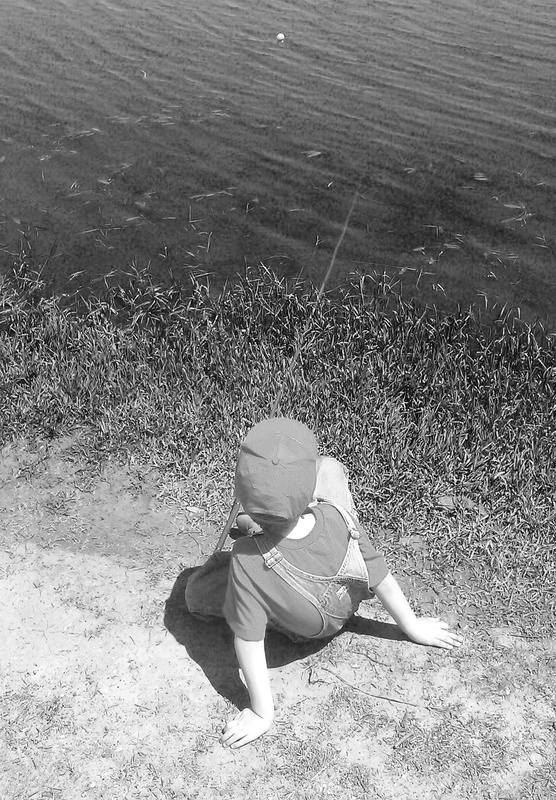 Luke, as a five-year old is apt to do, turned and skipped off to Granddad who had already cast his line into the water. Oh I still struggled baiting that hook. But slowly I got it done and Luke was along side his hero, Granddad and got his pole in the water. At that point I didn’t care if I baited my own pole. I watched the joy of my life standing next to my Daddy fishing. I did what any proud dad would do. I grabbed my cell phone and took pictures. I truly had a Facebook moment. Hello my name is Joy, I would like to introduce myself to you! This is who I wanted to show up. When Joy comes old man Parky disappears for a while. Oh I know he will return, but I can enjoy a few moments of life. I didn’t catch any fish. Granddad caught two hands sized fish that were immediately tossed back in. But Luke thought it was awesome. So did I. King David of Israel had a life of dysfunction. In one his writings (Psalm 30) I summarize his thoughts; I will exalt you, O LORD, for you spared me from going down to the pit. I cried to you for mercy. You turned my mourning into dancing.